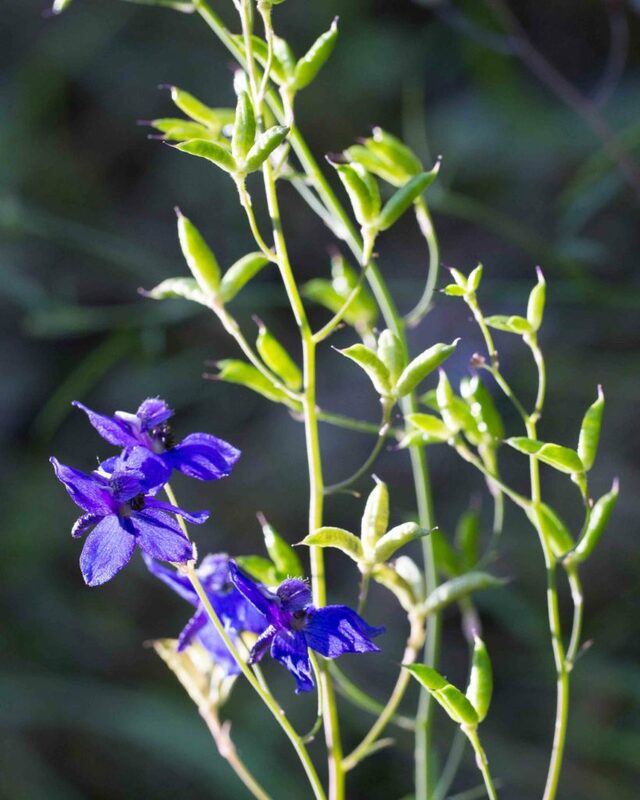 Some larkspurs can be tricky to identify. The structure of the flower is not intuitive. 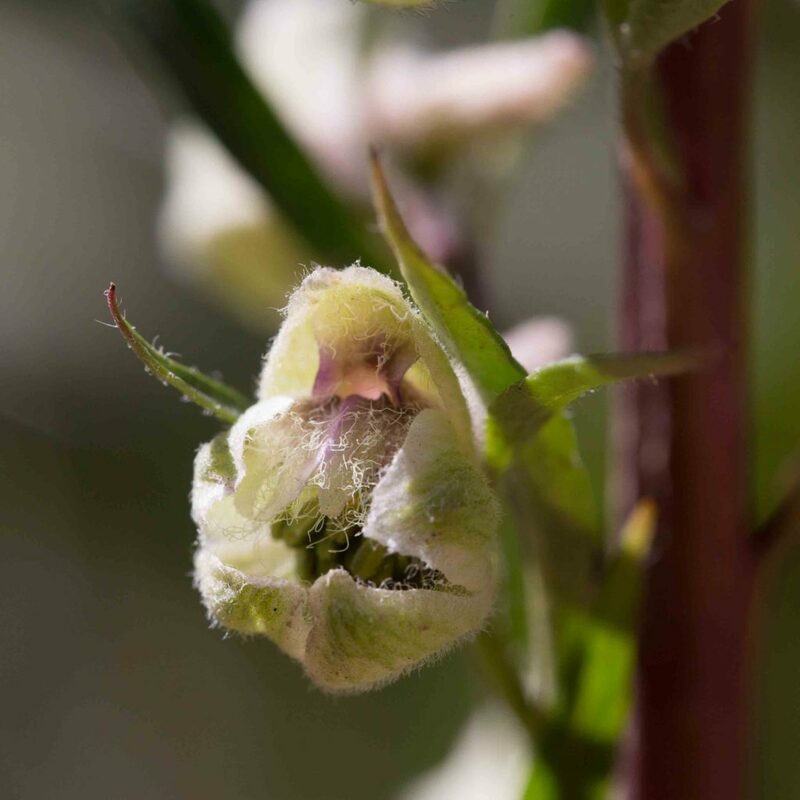 What look like petals are actually sepals, the uppermost sepal extending back to cover the nectar-secreting spurs of the two upper petals into the eponymous spur. 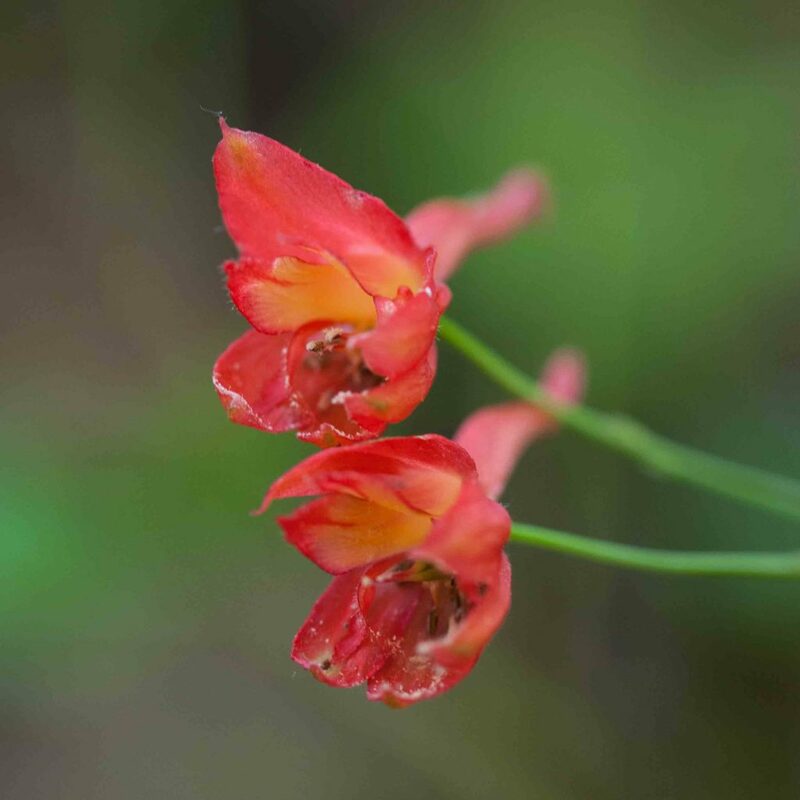 The two lower petals (usually the same color as the sepals) are in the center of the flower, much smaller than the sepals, generally vertically aligned and sometimes appearing more or less joined to form a raised dome. Whether the lateral sepals are spreading with the tips facing forward or recurved (swept back) can be critical to identification. Likewise whether the fruits are straight with only the tips curved out or widely spreading. Leaves vary widely with lobes ranging from the very narrow to the broad, sometimes withering before flowering, sometimes not. 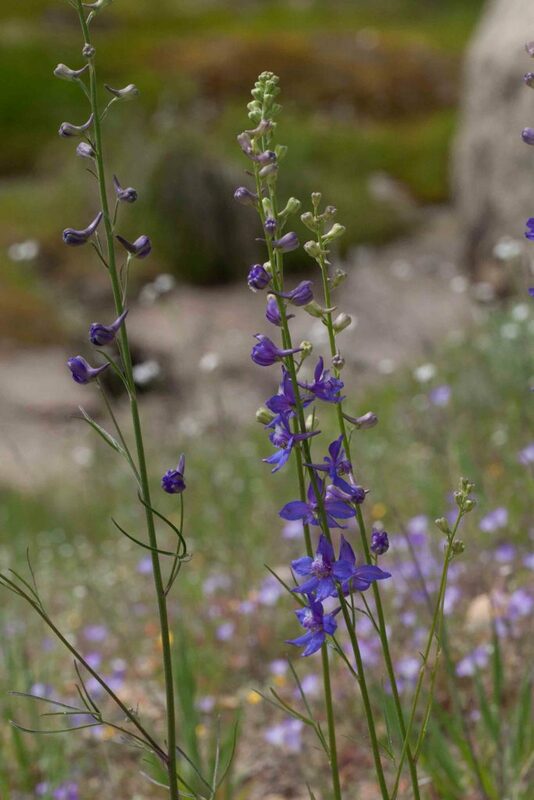 This is much the tallest larkspur found in the county. 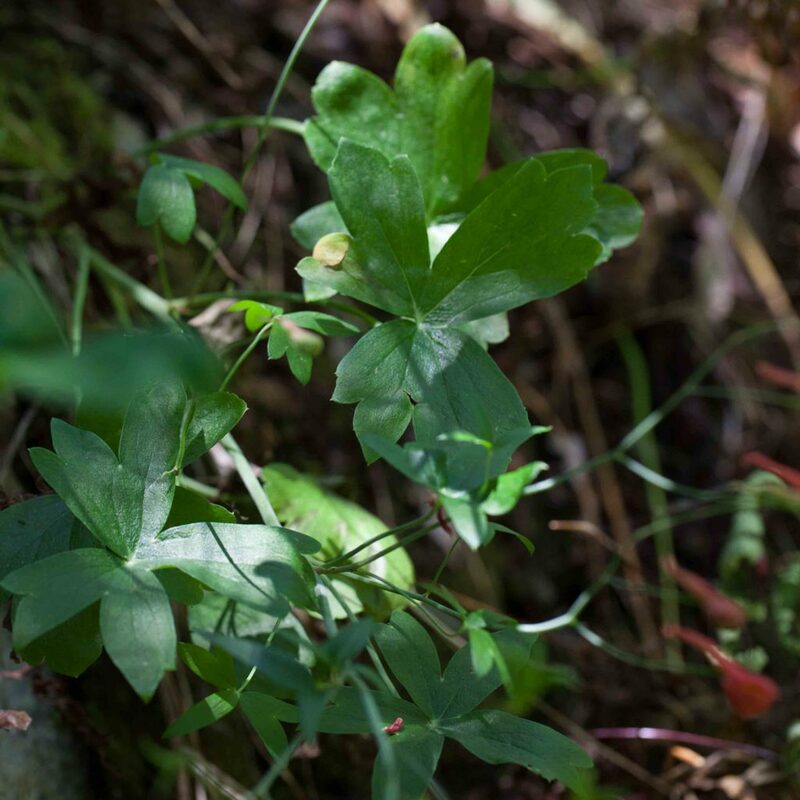 Its leaves are variable, with 3–15 lobes, 5–60 mm wide with sharply-cut tips. 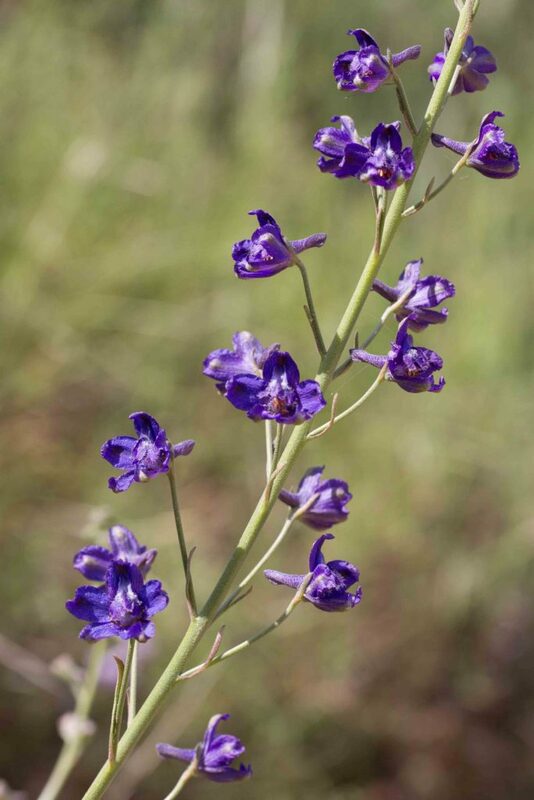 The large inflorescence has > 50 flowers with 6–65 mm pedicels, clearly separated on the stem, 5–25 mm apart. 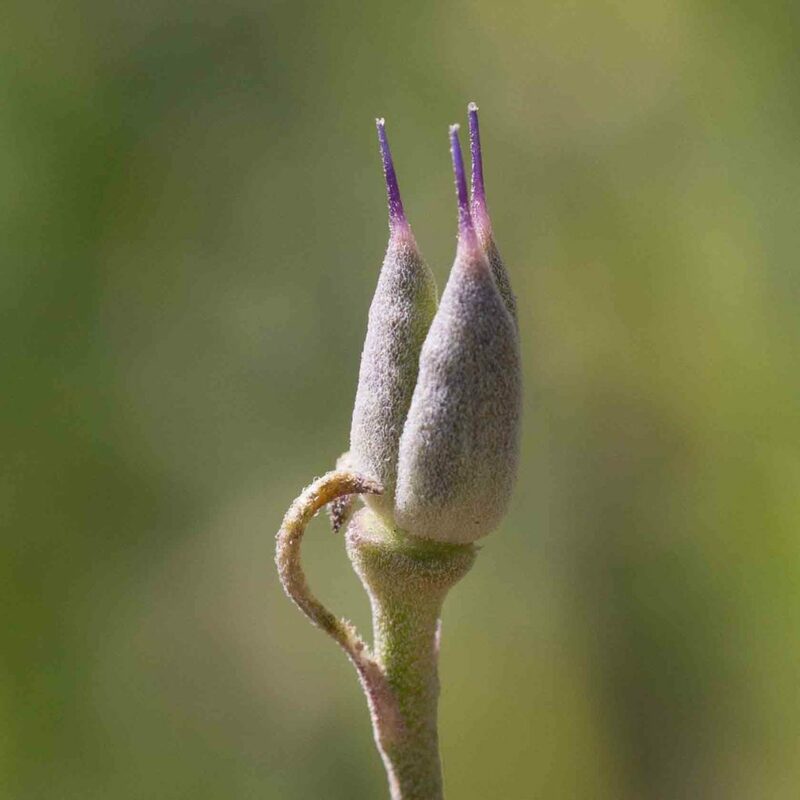 The lavender, densely puberulent sepals are forward pointing. The spur is 7–14 mm long. 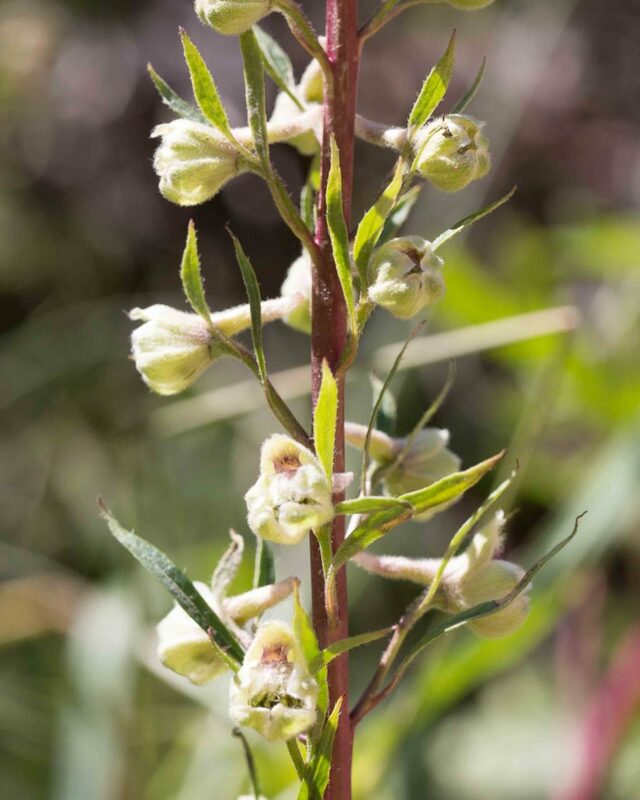 The flower is white to greenish-white to pale lavender. 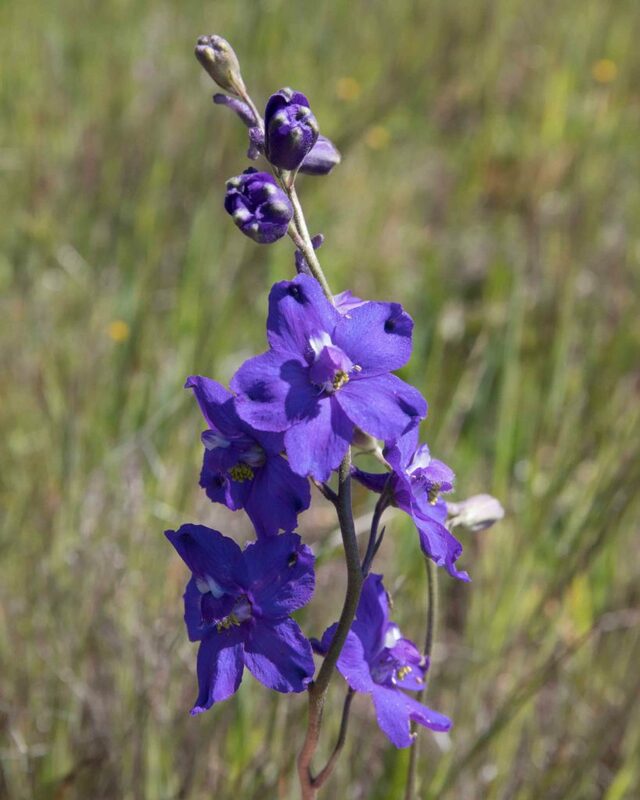 A tall, dramatic plant, one of only 2 red-flowered larkspurs in the county. Spurs are straight, < 2.5 cm long with upturned tips. Leaves have 5–27 lobes and are generally withered at blooming. 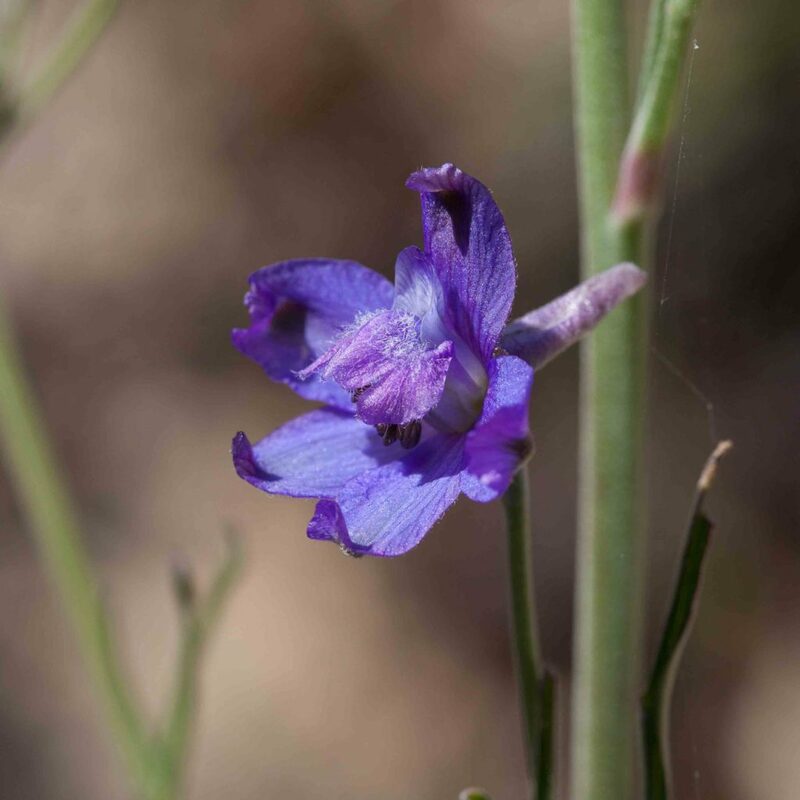 Although individual flowers are somewhat dissimilar to those of Red Larkspur (Delphinium nudicaule), the appearance of the plant and its habitat are entirely different. Another point of difference is the fruits which are straight, spreading only at the tips. 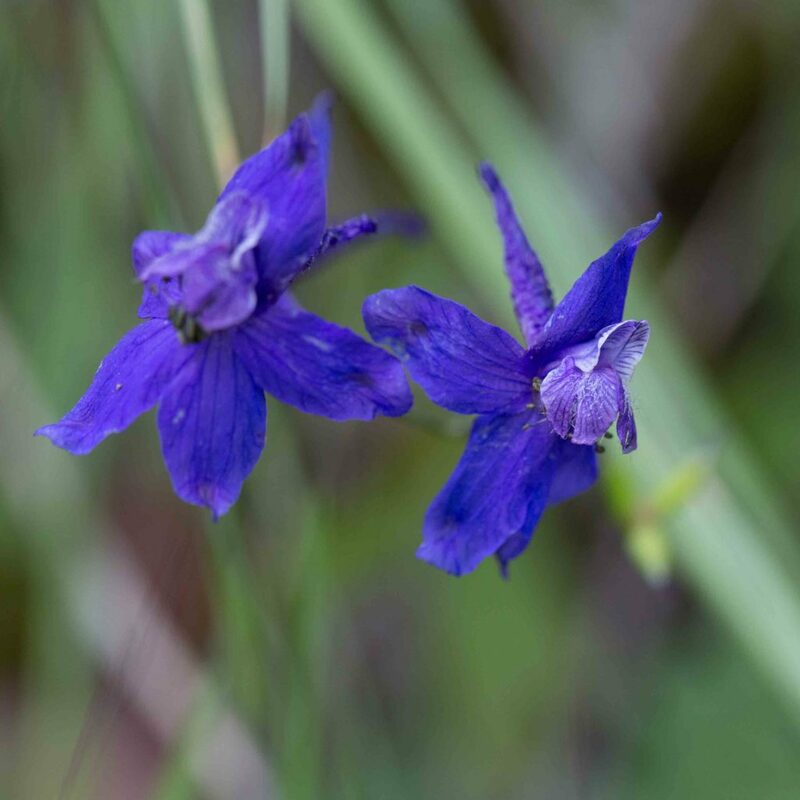 One of only 2 red-flowered larkspurs in the county but, though striking, rather less dramatic than Scarlet Larkspur (Delphinium cardinale) and found in very different habitats. Spurs are straight, < 3.5 cm long, slightly wavy with downturned tips. 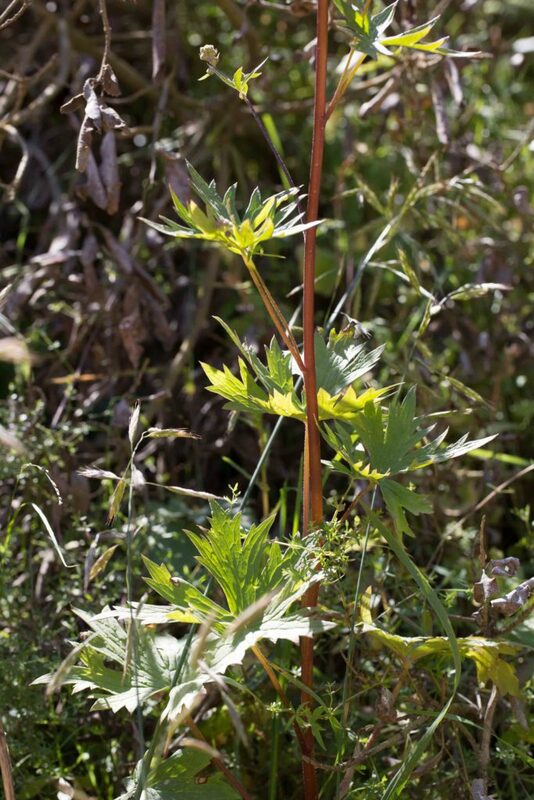 Leaves are round to pentagonal with 3–12 broad lobes and are generally still visible at blooming. 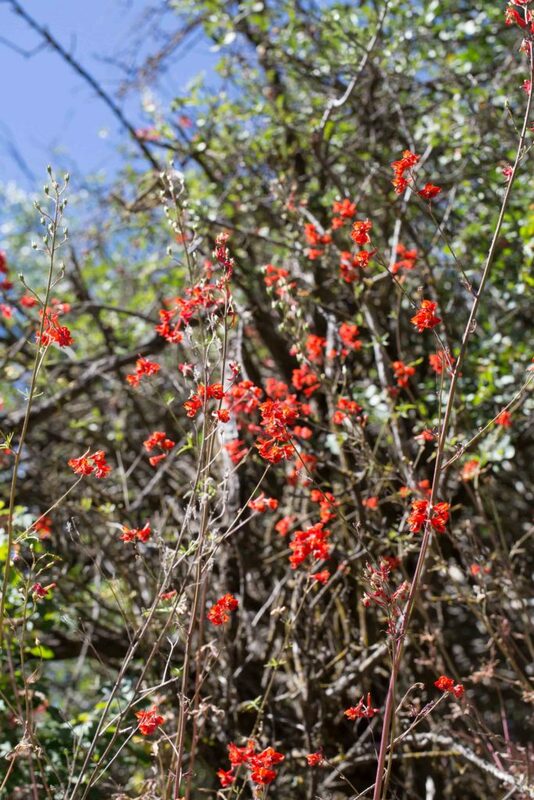 The fruits are widely spreading, unlike the straight fruits of Scarlet Larkspur. 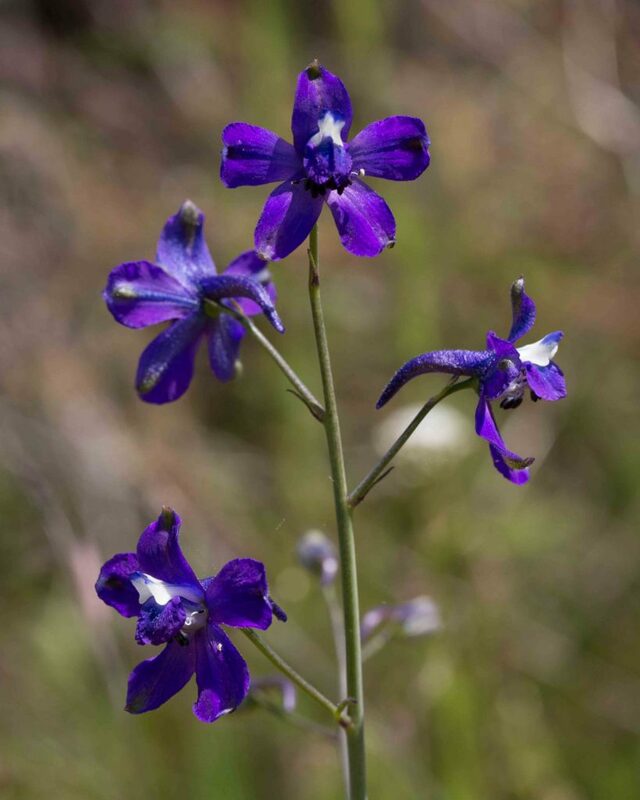 This species is found both in dark blue forms (subsp. 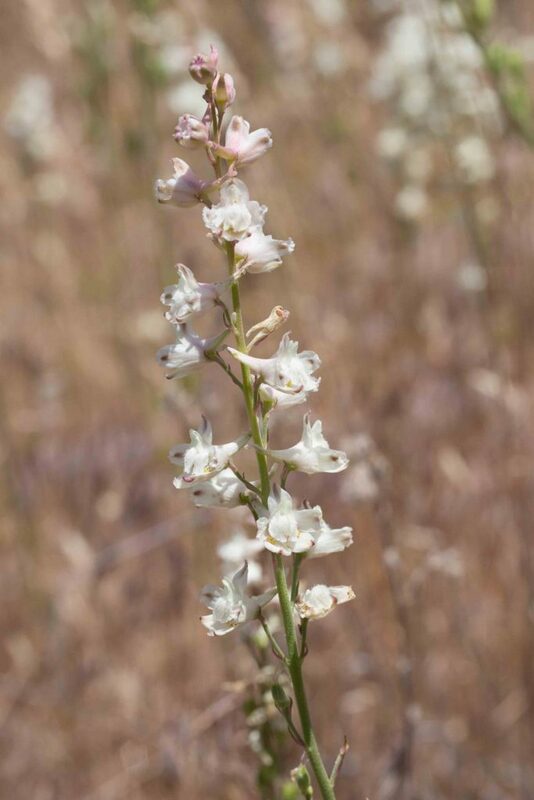 hesperium) and pale forms which may be either white, pinkish or light blue. Leaves are divided into 3–14 narrow lobes, 2–8 mm wide. 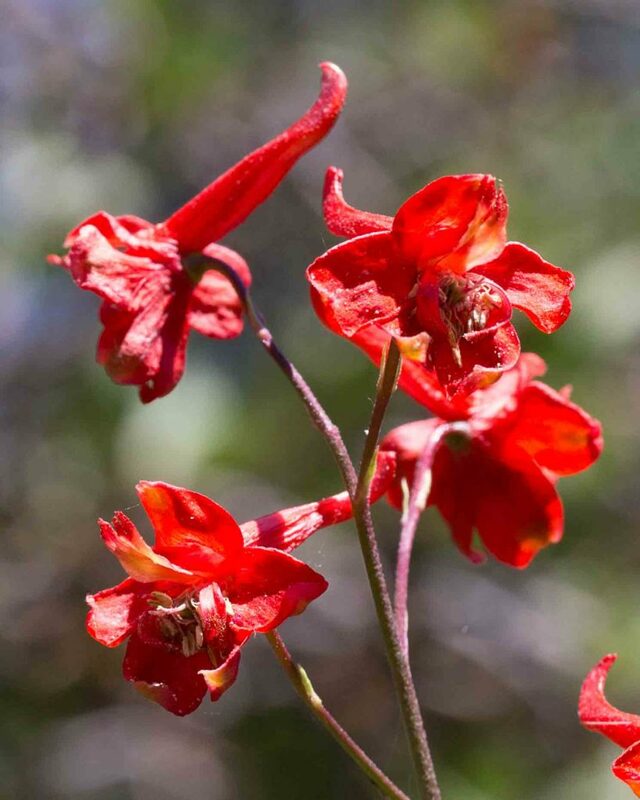 Flowers are generally fewer than 30, with pedicels separated on the stem by at least 8 mm. Lateral sepals are spreading. Lower petals are in rounded domes, hairier on the front than the back. Fruits are more or less straight. 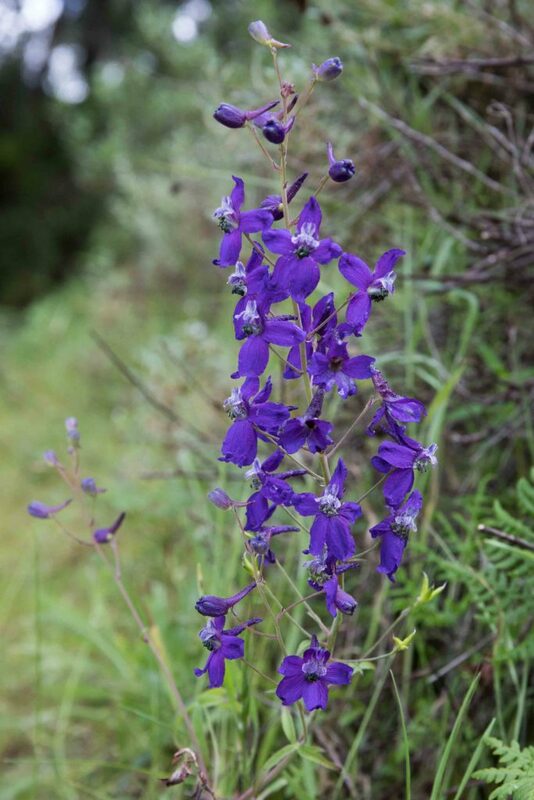 This rare larkspur is known only from coastal areas in Monterey County. 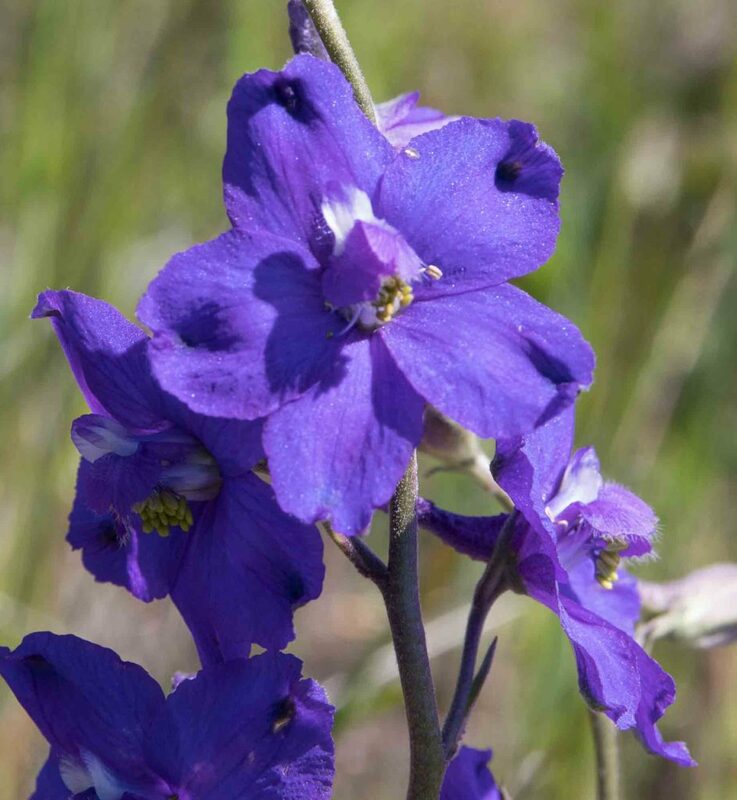 The lateral sepals are a little larger than those of Zigzag or Parry’s Larkspur (Delphinium patens or parryi); 12–24 as against 9–10 mm). 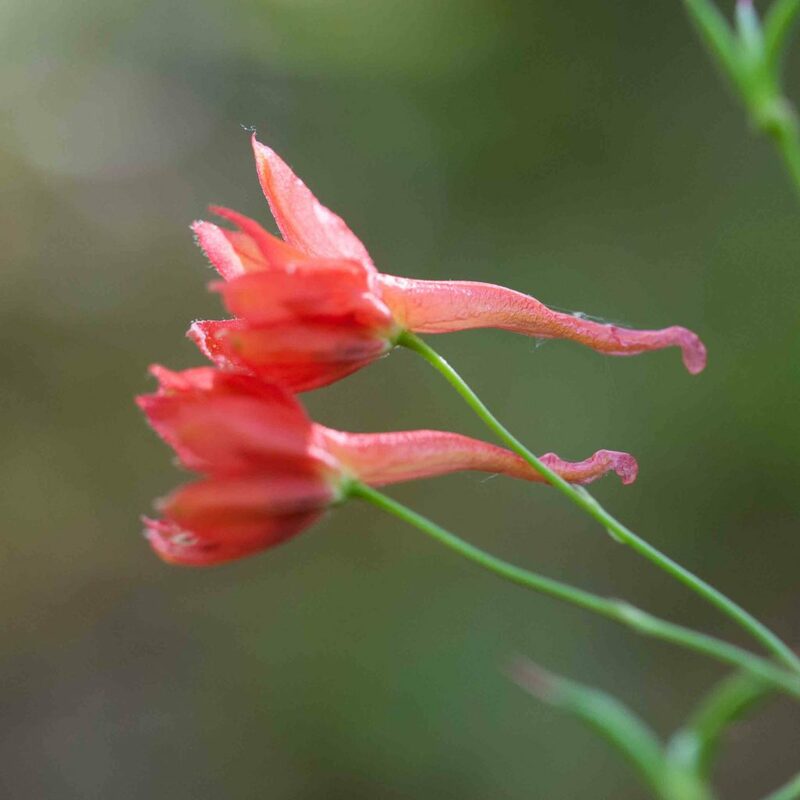 The two upper petals are usually white, the lower petals have hairs on the blades but not the edges. 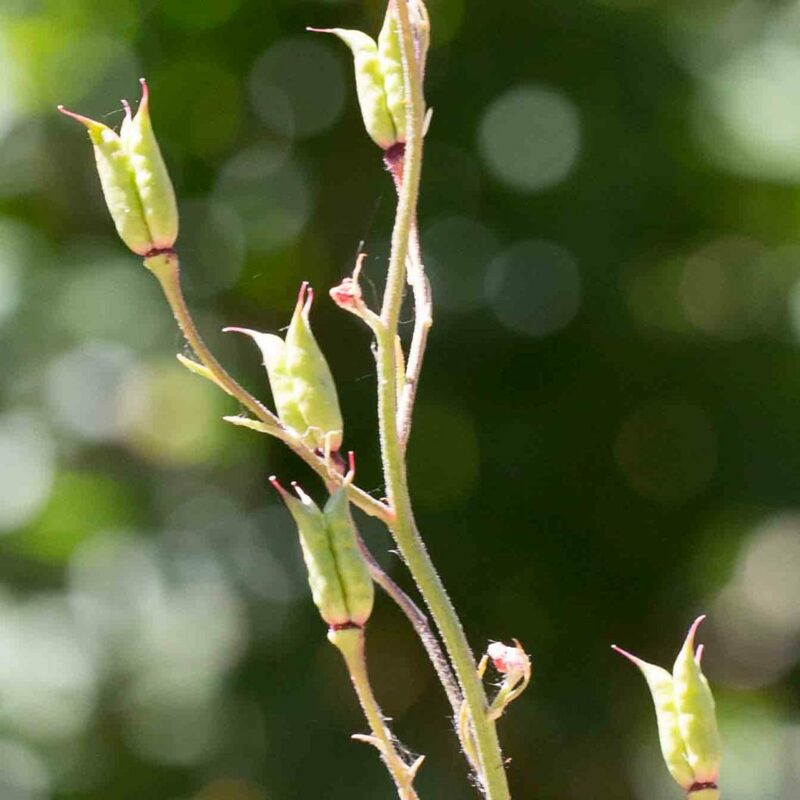 The stems are often branched. The tip of the spur is typically downcurved by > 3 mm. Leaves are 5–17 lobed. 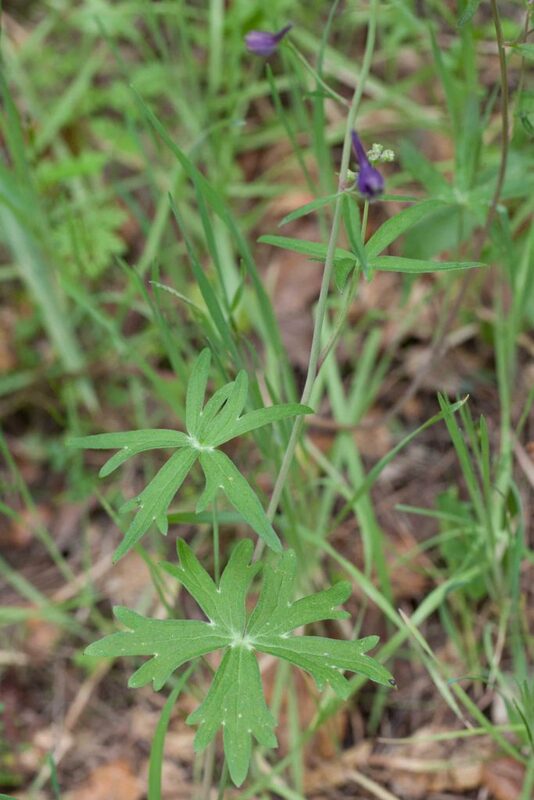 This common larkspur is sometimes found near Zigzag Larkspur (Delphinium patens). Although superficially similar to it, there are several features that allow the two to be distinguished. 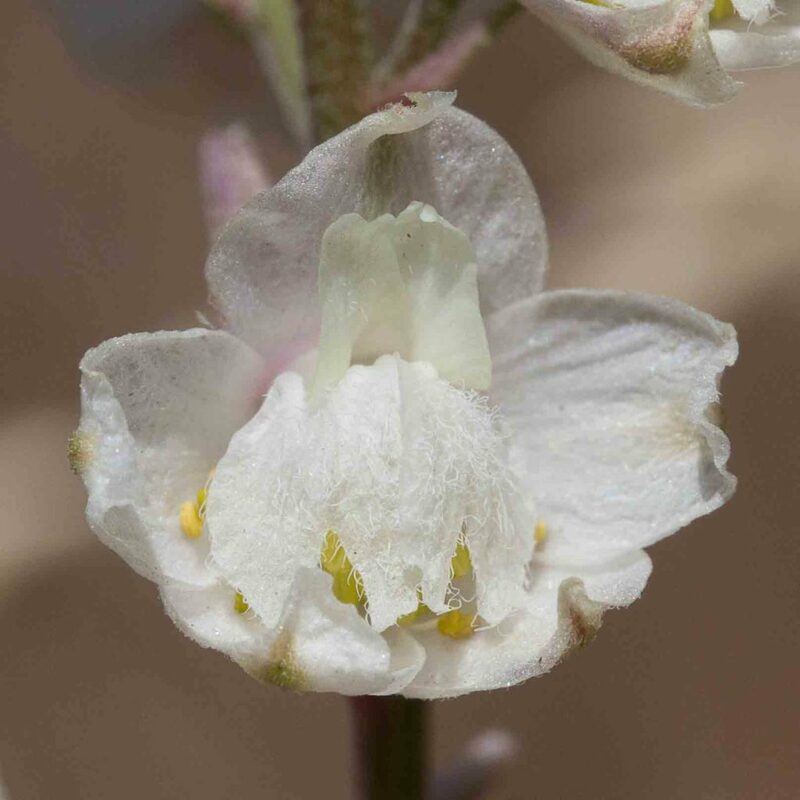 First, Parry’s Larkspur has lateral sepals that are spreading with forward pointing tips. 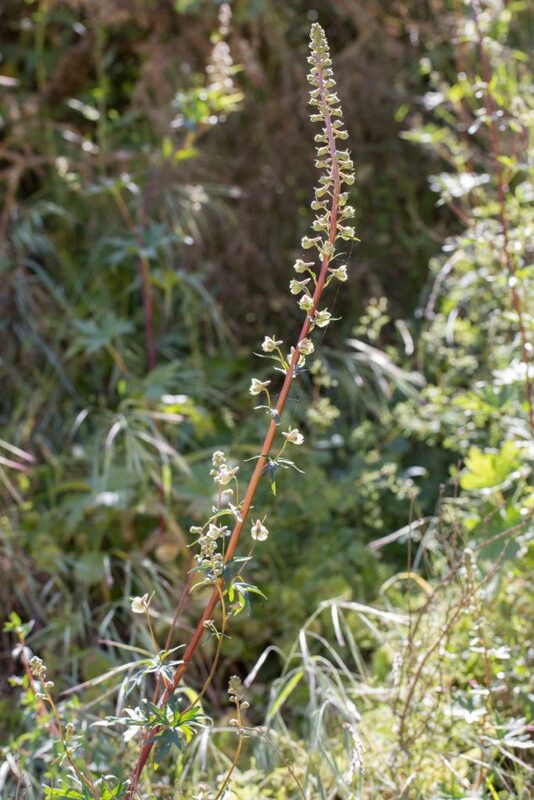 Secondly, its leaves are divided into narrow, almost thread-like lobes that are generally withered by blooming time. Third, its fruits are more or less straight. The spur is 8–15 mm long and usually downcurved at the tip. 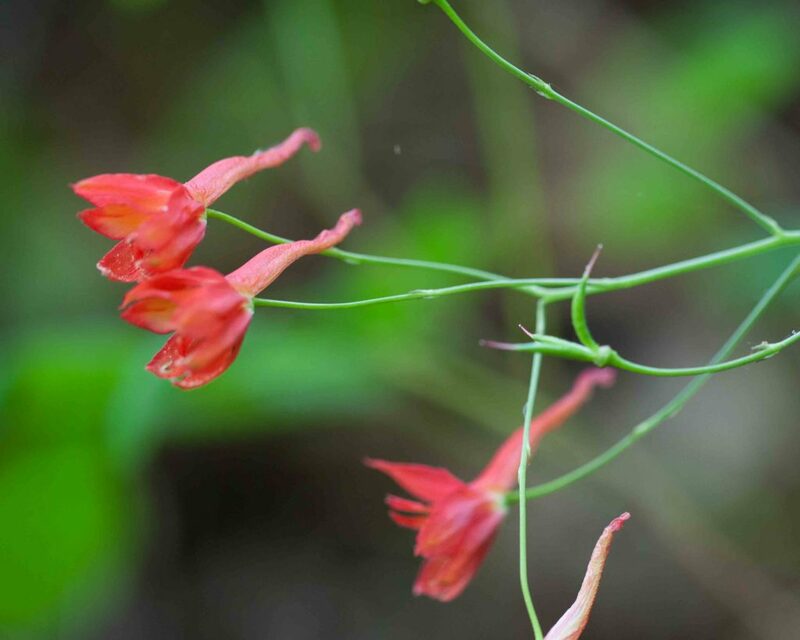 The lower petals are equally hairy on both surfaces. 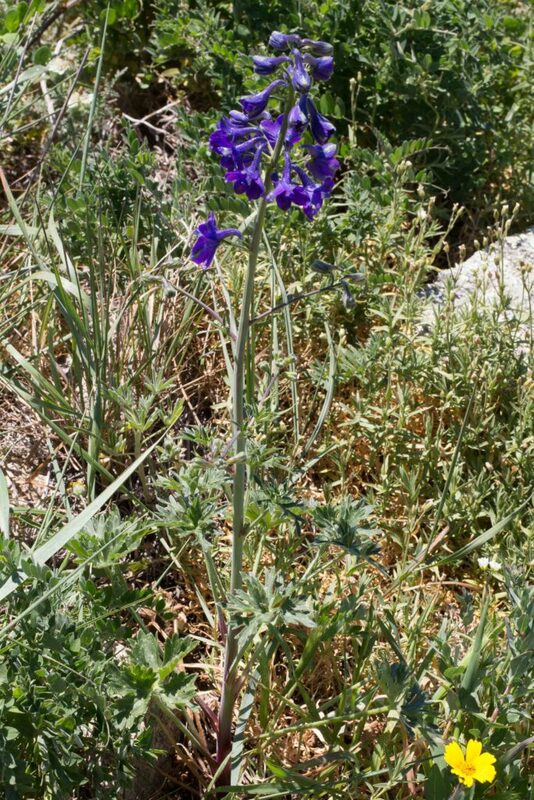 Common near the coast, this larkspur is sometimes found near Parry’s Larkspur (Delphinium patens) and may be confused with it. 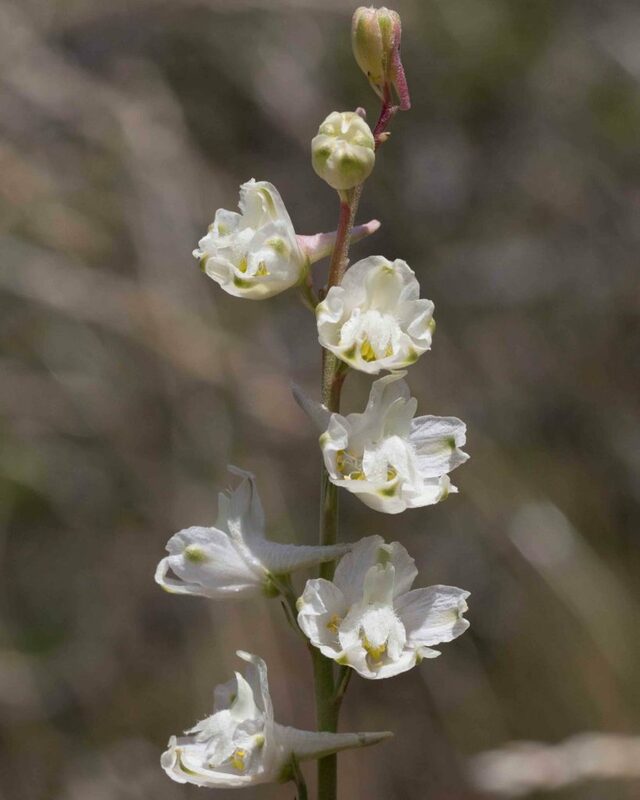 Although superficially similar, there are several features that allow the two to be distinguished in addition to the fact that this species blooms a little earlier. 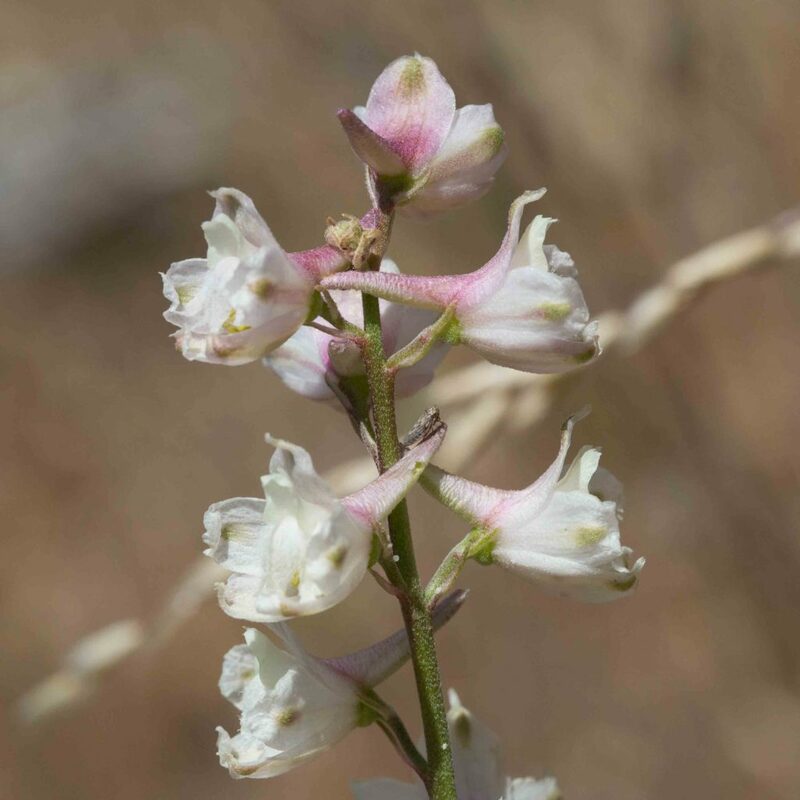 First, Zigzag Larkspur has lateral sepals that are recurved (folded slightly back). 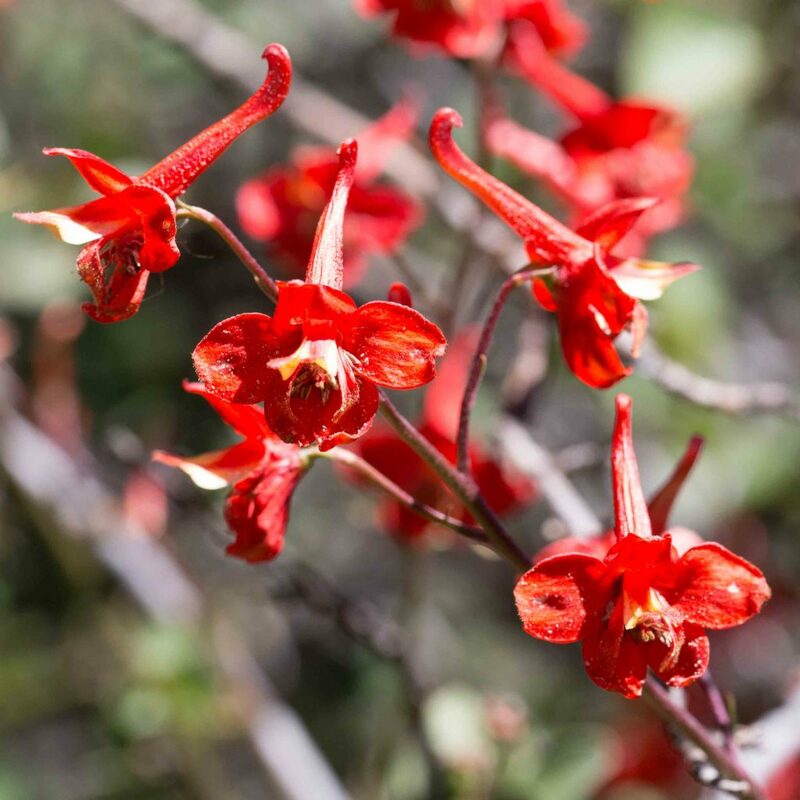 Secondly, its leaves are not generally withered before blooming and are divided into 3–5 comparatively broad lobes. Third, its fruits are noticeably spreading. 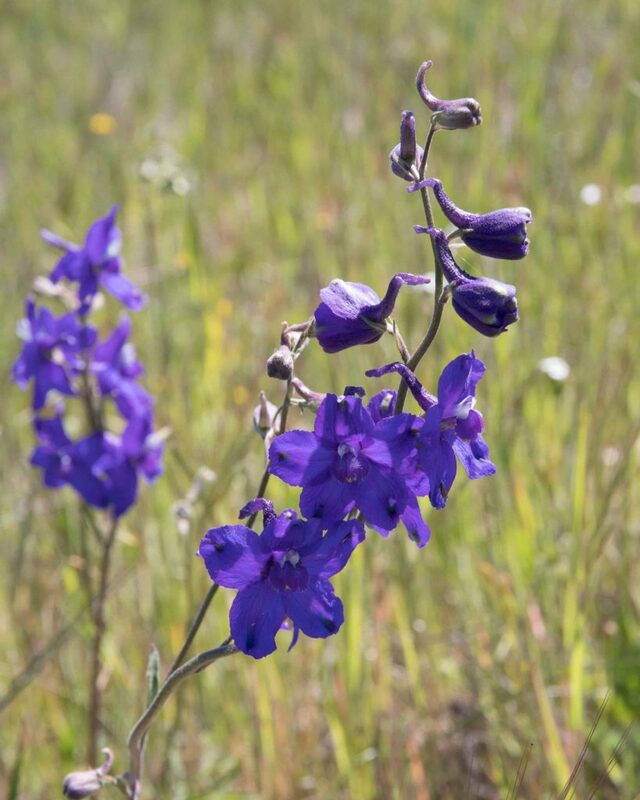 The lower petals are noticeably bi-lobed and generally hairier on the upper surfaces. 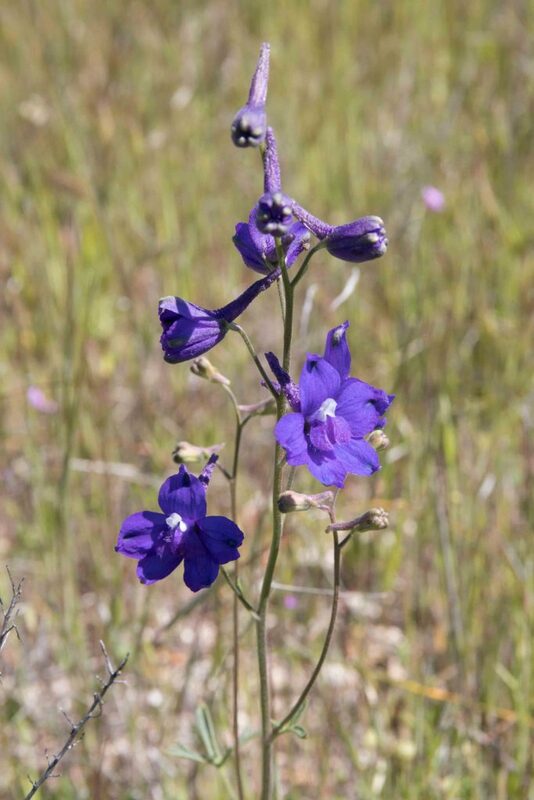 This is somewhat similar to Hutchinson’s Larkspur (Delphinium hutchinsoniae) in appearance but is found only in the southern part of the county, commonly in Fort Hunter Liggett. 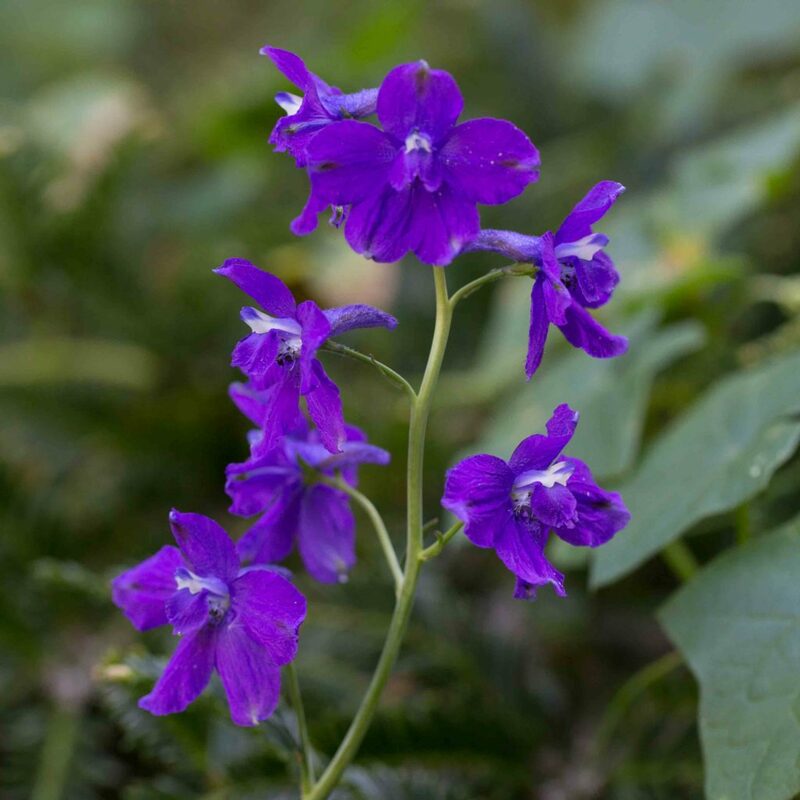 The color of the sepals is subtly different, normally royal blue rather than purplish-blue and they are a little smaller (12–17 mm as against 12–24 mm). The tip of the spur may be straight or slightly downcurved. 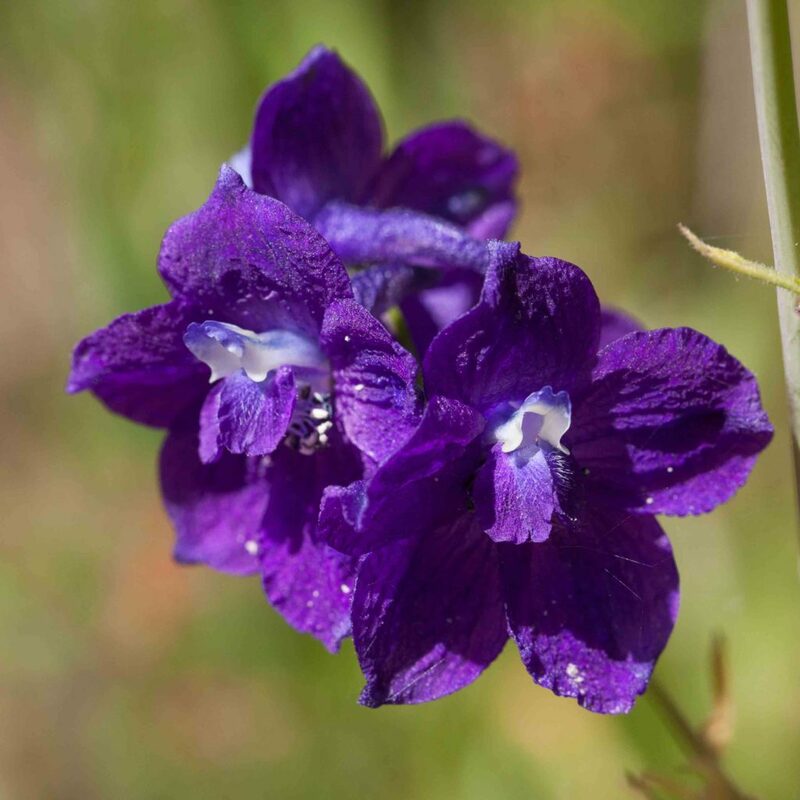 The lower petals have sparse marginal hairs where those of Hutchinson’s Larkspur have hairs only on the blades. The number of flowers on the main axis is generally smaller (< 10 as against 7–20). In both species the fruits are straight and at least the cauline leaves not withering before flowering.